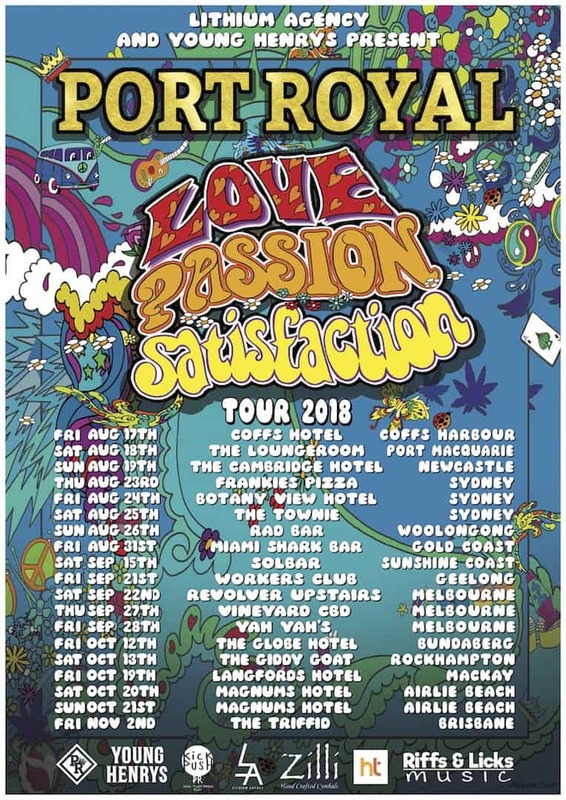 Port Royal is currently on tour in support of our new EP ‘Love Passion Satisfaction’. ‘Love Passion Satisfaction’ is a feel good Rock’n’roll record which explodes with a new wave rocknroll sound thats inspired by the greats of yesterday. Id probably have to say our new track Lucy which is track 5 on the EP. I have a very personal attachment to this track as its one of the first songs that i felt as a primary songwritter. I worked on the song with our lead singer/rhythm guitarist Lawson about 2 years ago and together we were able to come up with something that im veru proud of. When we recently played in Port Maquarie Liam our lead guitaris, Jacob our manager and i were all still up around 2am having a few drinks and enjoying the evening. Until we got offerred to attend an early morning jam session with a couple of old rockers. We decided to take them up on this offer and it was nothing short of incredible. Something ill never forget. My biggest drumming inspirations would have to be Dominic Howard of Muse and John Bonham of Led Zeppelin. Both of those guys really taught me everything i know about rock n roll drumming and continue to inspire a lot of my drums patterns today. I really wish i wrote ‘Bad’ by U2. I came to love U2 as a kid after my dad showed me their performance at Live Aid and ill never forget watching them play ‘Bad’ for the first time. Absolute masterpiece. I’d probably have to say a secilian tappas of spice and emotion followed by a side of spicy kung pao chicken (hold the salad). Port Royal aint messing around. Well we are roughly half way through this EP tour so we sre really lookojg forward to more time on the road and also our massive homecoming show at The Triffid in Brisbane. We are already starting to make plans for more touring and some new releases. The brisbane musis scene is our spiritual home. The scene in Brisbane is constsntly growing with new talented bands re inventing some incredible genres. The rock and roll scene in Brisbane in growing as well which we are very proud to be apart of. The swing of the Stones, the riffage of Zeppelin and the psychedelica of latter day Beatles combine for a retro journey like no other. Sing alongs, good vibes and a feeling of innocence. Port Royal are the ultimate escape from modernity, back to a time where it really was all about the songs. Formed in 2015, they came out swinging with their first EP, The Express, in mid 2016 and hit the road playing with the likes of The Delta Riggs, Wolfmother and The Cherry Dolls and quickly built up a rep as a band to watch. In 2017 they dropped the rocking Get Heavy. It’s Stooges like swagger saw it get voted in at #2 on 4ZZZ’s Hot 100 on New Years Day 2018 and the band toured the east coast again, gaining new fans at every show. In April this year, Port Royal unleashed a belter in the form of Rock & Roll Is Dead. The track proves that rock is anything but dead. It’s loose, high octane retro goodness was the fuel for another east coast run that culminated in a sold out homecoming show! With its Beatlesque swing and sing along chorus reminsicent of some of Brit Rocks finest, it’s retro vibe also feels refreshingly new. And.. that Trumpet solo is killer! Port Royal’s second EP, Love, Passion, Satisfaction features 5 tracks of potent, good time rock n roll that evoke the blues, basslines and hooks of rocks heyday while lyrically keeping it real with themes of equality and positivity. 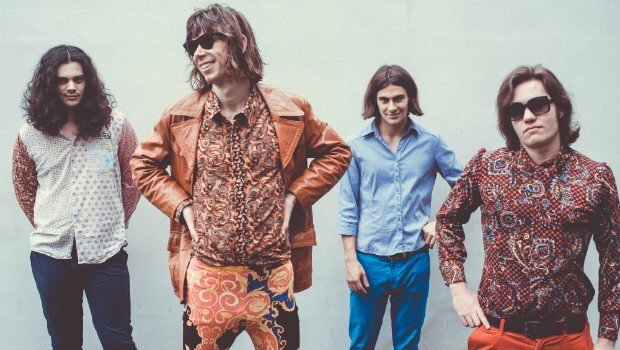 The boys have already put a stack of miles on the clock supporting Love, Passion, Satisfaction taking their tunes down through NSW, selling out merch AND rooms along the way. But the tour is far from over. If you haven’t experienced a rock n roll show in a while, get to one of these shows! Love, Passion, Satisfaction is available now!